Rajendra Chola-I (1012-1044 A.D) son of the Great Rajaraja-I, established this temple after his great victorious march to river Ganges on Northern India. He was originally called Madurantakan. He assumed the title of Rajendra during his coronation and continued to rule along with his father Rajaraja-I for a while. He achieved the supreme title of Cholas called Parakesari . 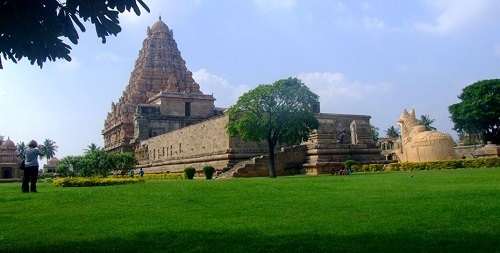 His empire extended the whole of southern India to river Thungabathra in the north India, for administrative and strategic purpose he built another capital and named Gangaikondacholapuram. The Gangaikondacholapuram temple, he constructed consists of 3 stories and surrounded by a huge fort like wall, the outer wall was greatly destructed during the English rule (1896 A.D) to reuse the building material (Granite rocks) for constructing the Lower Anicut (Dam across river Kollidam). He built around 10 temples at various places. He assumed the title of Gangaikonda Cholan and named his new capital as Gangaikondacholapuram and he also constructed a huge Lake known as Chola Gangam that spreads 22 km mainly used for drinking and irrigation. A statue of Rajendra-I is found in Kolaram temple at Kolar of Karnataka state in India. Sri Kaliyaperumal temple is a major attraction of Ariyalur. 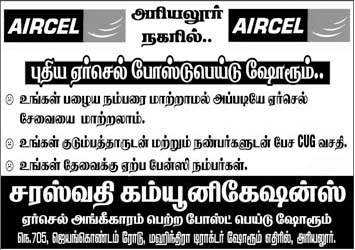 It is situated at 6 km away from Ariyalur. 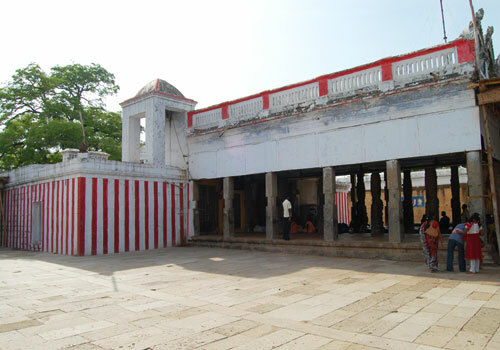 This temple is famous for its "Car festival" (March/April) which is conducted yearly. The people of Ariyalur celebrate the festival grandly. The temple is also famous for the Puraittasi Saturdays. Every year in the month of 'Puraittasi' (September), special Pujas, 'Arathanai', 'Abishekams', etc. are done on the four Saturdays. This also is a major attraction of the Kaliyaperumal temple. This Varadharaja permal blesses with prosperity, wealth, health and a long life. About 250 years ago, one Gopalan, belonging to Vanniya community was residing in Ariyalur Sidhalavadi. His son Mangan was managing a herd of cows. He found one of the cows in its advanced pregnant state missing and could not find it even after three day search. On the third night, Lord appeared in his dream and said that his cow was safe at a place two miles westward between a banyan and Mavilinga tree near a bush and that he could pick his cow and calf. Mangan was too happy to have his cow and calf at the place indicated by the Lord and found a post wet with the milk of the cow. He worshipped the post and returned home happily. On the seventh night then, Mangan heard the Lord telling him in the dream what great a fool was he to return home with his cow and calf only leaving the post which even great rishis could not see even after a penance of 8000 years. You have left behind a thing that has no end. You are not aware of the relationship between me and your ancestors who were worshipping Vishnu in Seethalavadi. They were bringing this post to build a temple but could not as the axis of the cart broke down on the way and they left me there. It is the wooden post you saw the other day. It is now your duty to install the post and begin the worship. I hid your cow only to remind you of your duty. I am Kaliyuga Perumal. So saying, Lord disappeared. Mangan took the command of the Lord on his head, brought the wooden post and built the temple. Kaliyuga Varadaraja Perumal thus came into being in Kallankurichi. In a letter dated 19-12-1726 written to Rome, Beschi introduces himself as already the Vicar Forane of Tanjavur. So we can safely presume Beschi was at Elakurichi from 1721 onwards. During his stay at Elakurichi a very severe famine overtook that area. Thousands of people died of starvation. Mothers sold their infants just for a few measures of rice. The protestant Danish mission at Tranquebar took advantage of this situration. Generously spending the large amount of money that was at their disposal, they began to net the catholics in to their fold. To avail themselves of this monetary assistance, a number of catholics and even some catechists crossed over to their fold. It was at this juncture that he chose to invoke Mary as "Adaikala Madha" (Our Lady of Refuge) and composed a booklet called "Thirukavalur Kalambaham" in her honour. Things began to take a new turn. There was good rain and the famine disappeared. The Catholics who strayed away fro the sake of money returned to the fold. Miracluous favours began to flow. When a fire accident accured at that time in the village, in spite of the strong wind the huts of the Christiants were untouched by the fire. Fr. Beschi understo9od that our Lady had come to live with them and protect them. Wtih the recommendation of the Archbishop of Mylapore he submitted an application, through his Jesuit General in Rome, to His Holiness the Pope for permission to celebrate solemnly the titular feast of "Adaikalamatha" on the third Sunday after Easter every year and also for the sanction of a plenary indulgence for the faithful participating in it. He received the letter of sanction signed by His Holiness himself towards the end of 1733. About this time the chieftain of Ariyalur, Rengappa Malavarayar came to see Fr. Beschi. He was very much taken up by the learning and piety of Fr. Beschi He was astonished that an European like Beschi could possess such a vast and deep knowledge of "Tamil Grammar" and "Literature". As a token of his appreciation he donated about 175 acres to this Church. The stone tablet attesting to this fact can be seen even today in the church compound. This is an important temple in the heart of the town.The 'Dasaavathara Mandapam' with excellent sculptures of the ten avtars of Maha Vishnu,especially the Narasimha avatara is worth seeing. The temple car which is now in ruins is being rebuilt with the co-operation of the devotees and also helped by the Government to a great extent. The 'Pancha Loka Vigrahas' of Sri Rama, Lakshmana and Sita have been majestically made and a treat to watch.It is believed that these Pancha Loka Vigrahas is biggest Idol in the world. Sivan Kovil is also a popular temple. Pradosham worship is attended by many devotees regularly.